Danville Science Center celebrates its annual Butterfly Hello and Thyme on April 19 with an herb fair, hands-on activities and butterfly releases. 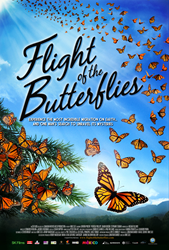 The giant screen film, Flight of the Butterflies, will be featured in Danville Science Center's new Dome theater. Danville Science Center celebrates its annual Butterfly Hello and Thyme on Saturday, April 19. Early birds can dig into gardening at the Herb Fair from 9 am – Noon. Experts on site will cultivate guests’ knowledge to strengthen the green thumb of novice gardeners and experienced horticulturalists alike. Find unique items to sow, savor and save – from aromatic herbs to colorful flowering plants that will attract all sorts of visitors, including butterflies. Learn more about butterflies from 11 am – 3 pm with hands-on activities and craft stations that are fun for the whole family. Flutter to the Butterfly Garden at noon and be among the first guests to see the butterflies take flight. The new Dome theater inside Danville Science Center will also feature Flight of the Butterflies. Migrate with millions of Monarch butterflies across North America and experience firsthand the migration cycle of butterflies spanning not only thousands of miles but generations. Butterfly Hello! And Thyme is a free event. Tickets to Danville Science Center and a feature in the new Dome are $10 with $1 discounts for children 4-12 and 60+. For more information, visit dsc.smv.org or call 434.791.5160.